Like the look of the patent trend? 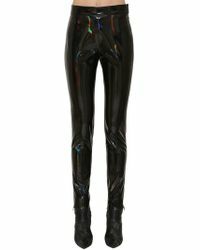 Glossy styles are everywhere and there's no better way to wear the trend than with a pair of vinyl pants. 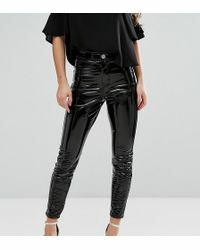 Spotted on Alexa Chung and all the fashion week cool hunters, vinyl pants are an easy way to make a simple T-shirt and mules outfit into a statement look. With styles by TOPSHOP, Vetements, Loewe and more, choose your favourite colour and add a slogan T-shirt for street-style perfection.